How would you describe yourself – who is Ori Toor? I'm an introvert guy who likes to draw. I consider myself vegan until desert comes. Could you tell us a bit about your journey into illustration & animation? Which one of them you are enjoying the most? I've been bouncing around between those two all of my life. I think I changed my mind about which I wanted to focus on, like a thousand times. Even when I was studying illustration, I did an animated final project. After a long time doing both disciplines they really start informing each other. I've definitely been enjoying illustration more for the past couple of years, but I can change my mind way to fast for my own good. When we were going through your work we felt a change in your style of illustrating. Do you like to experiment with your style sometimes? What kind of emotions do you try to awaken with your style? There are changes and there are changes. The more subtle ones happen slowly over time. But the major ones I had in my life where usually my depression propelling me to be more radical with my experiments. I've been happier for a while now, so I'm starting to deal with the urge to change more because of boredom and the need to reignite my interests. It's probably both. Every human has that potential to create but it's a question of nurturing or depressing that potential. What work of yours are you most proud of? What is the story behind it? I've been asked that a few times and I keep giving different answers. After I make a piece I move away from it so fast, it's hard to really remember how I felt when making it. I do have a soft spot for this personal piece but I don't remember the story behind it (if there is one). It looks like you are doing more illustration than the animation recently. Are you going to continue doing more looping videos on your Looopism tumblr account? Never say never. Right now I'm all in on illustration, but remember, I change my mind about my work pretty fast. I am very proud, though, looking through looopism. There's lots of stuff there! Do you also have anything in your life that loops or wish to loops? I with my time hanging with my friends and partner would loop forever (but with some breaks in between). 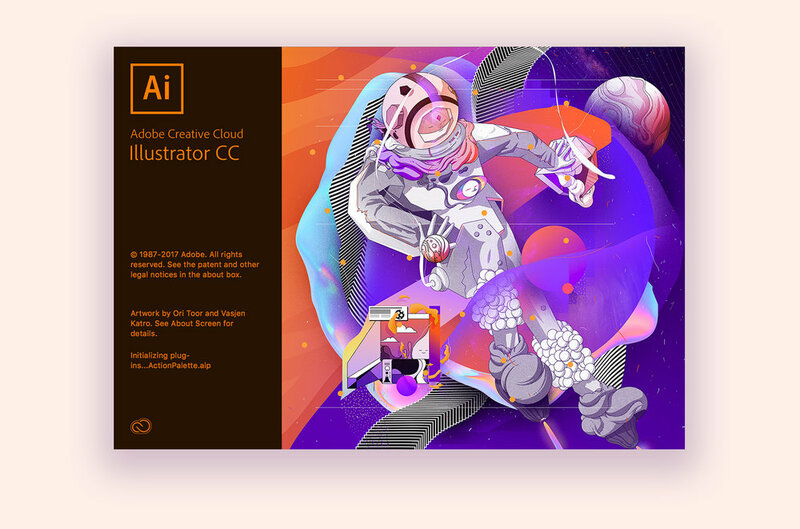 You also designed Adobe Illustrator 2018 Splash Screen with Vasjen Katro. How was the creative process? Did you have any challenges during the process? How did you feel when they updated the splash screen with a new illustration? That project was an unexpected dream coming true. It was also the first time for me actually successfully collaborating with someone on a single piece. Vasjen and I had great chemistry together and it felt like a really bonding experience. The main challenge was for the both of us not to be too shy and careful with each other's work. We had to really encourage each other to dare to "spoil" and change what the other person already created. I think we managed nicely. When they updated that splash screen I was so proud and happy I could burst. Each time I opened the program it was surprising to see until I got used to it. But it always stayed very surreal. Have you found any inspiration in an unexpected place recently? My inspiration is very random, so you could say it's always unexpected (Or super expected). I'll do you one better: Top 5 podcasts in no particular order: Giant beastcast, Replay all, Harmontown, Judge John Hodgman, The Weirdest Thing I Learned This Week. You’re living in Tel Aviv, Israel. Do you think the city you are living in affect the way you illustrate? Definitely, but in a very opposite way. Because it's very hot here, and because I see it everyday (and also because Israel has some depressing qualities) I tend to use my work for escape. In my inner world it's mostly raining, it's either sunset or evening, the architecture mostly traditional (instead of Tel Aviv Bauhaus). But every now and then the nicer parts of Tel Aviv seep in (The ocean, the coffee, the food, the sun, the porches and the cats). Where are your favorite spots in Tel Aviv? Food, coffee, shops, etc. There's tons of good food here, especially if you're vegetarian or vegan. So much great Humus. It's difficult to choose (But it's definitely Abu Ahdham and Carlibach st.) The coffee is pretty much great everywhere. if you end up with bad coffee you should feel special. I love going to the beach and just sit on the boardwalk for a while staring at the sea. Who are your creative heroes? Writers, artists, musicians, family members or friends who influenced you as you were growing up? Have they changed over time? My mom has to be the most powerful influence. She's an amazing artist and I used to watch her do design work as a kid. Our styles are really converging. The music of Animal collective really opened my mind years ago. I remember listening to the album "Sung Tongs" thinking that something is wrong with my speakers. But it was just the music. Really unique for it's time (and still super awesome). Eran Hilleli - A crazy original animator and a friend. It's still amazes me that I can directly talk to someone who influenced me to much. A lot of people do low poly 3d art - but you can immediately tel if it's his or not. No one can replicate that style. Jon burgerman - Another hero I got the chance to talk to. His work showed me that doodling is just is legitimate is "illustrating" and that changed my life. Who do you admire in the animation world? The Fleischer brothers - I think animation exists for their work and not the other way around. Hayao Miyazaki - Do I need to say more? Pendelton ward - Creator of Adventure Time. My favorite show forever probably. Are you obsessed with something? Just bad stuff, like death and time. 1. My ears are totally not identical but people never notice it. 3. When I was in second grade I accidentally tore my ear drum with a Qtip. It was one of the most painful things that happened to me. They don't ask me about terrible clients and stuff like that. I think every working artist could write a book about bad clients.